Vegas getting ready for APPNATION: Discover. Acquire. Monetize. As you get ready for the Consumer Electronics Show (CES), you may wanna arrive in Vegas a few days earlier. 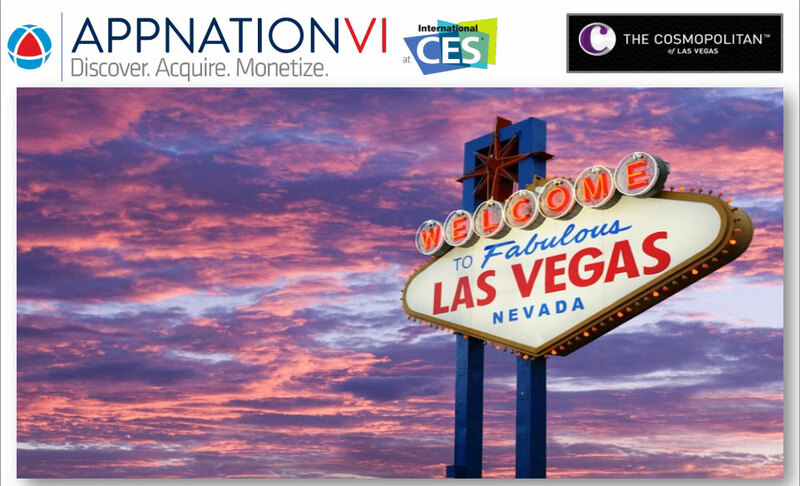 On January 5th and 6th, The Cosmopolitan Hotel is hosting APPNATION VI and is expecting 4000+ Attendees. APPNATION is the largest conference and exhibit in North America focused exclusively on the business of apps and the broader consumer app economy. The theme of this year’s event is: “Discover. Acquire. Monetize” and the show reaches the full long-tail of app developers and publishers from the cool indies all the way up through the largest brands and companies in the world. This is not a technical conference, as their mission is to help app developers of all shapes and sizes build great businesses through inspiring keynotes, topical round-table discussions, and deep-dive workshops that deliver actionable advice and best practices. APPNATION offers a wide range of sponsorship and exhibit opportunities for you to engage with key influencers and potential partners and showcase your expertise in their main agenda and on their main-stage. Click here to download the prospectus. For other questions and inquiries about sponsorship opportunities, please email Drew Ianni at drew@appnationconference.com. Categories: Attendee, Exhibitor, InternetTradeShows.com | Tags: acquire, app, appnation, appnation vi, ces, consumer electronics show, cosmopolitan hotel, discover, drew ianni, las vegas, monetize, sin city | Permalink. I was talking to a friend this morning about basic customer service skills and how companies and employees need more training in this area. As we were sharing horror stories, I was reminded of an experience I had with a reservations clerk from United Airlines about 15 years ago. I was on my way to a job interview in Sacramento on an early morning flight from Los Angeles. When I arrived at the airport, I was informed that the flight was cancelled due to mechanical issues with the plane. Okay, things happen. I wasn’t that concerned because it was so early in the morning and I was confident they would re-book me on a different flight soon enough. As an hour went by, followed by another one and then another one, the reservation clerks were blowing me off and not answering my questions or giving me new flight instructions. Obviously, a bit nervous about missing this opportunity, I asked one of the UA clerks if she had any suggestions or ideas that could help me in this desperate situation. When I finished my inquiry, the agent snapped back at me like a cornered bobcat and verbally let me have it. Her response was so harsh and inappropriate, I almost jumped over the counter and forced her down the luggage chute. Not only was she unwilling to make an attempt to help me, she belittled me in front of a line full of people. The United Airlines agent initially forgot what her job expectations were and how important it was to provide a quality service to her customers. Thankfully, with a loving nudge, she redeemed herself and performed her responsibilities with excellence. And because she reversed her position on the matter, I wrote a letter to United Airlines that day, expressing my thanks for her outstanding efforts. They wrote me back and thanked me for informing them of her customer service skills. The UA agent contacted me a few weeks later, as well. She wanted to take a moment to thank me for giving her a good review with the corporation. As it turned out, after upper management received my letter, the agent got promoted to supervisor. You never know who you’re serving when you’re dealing with customers. You never know the impact any given client could have on your future or the future of your company. Treat everyone like royalty and provide the best service possible. This kind of commitment to excellence never goes unrewarded. 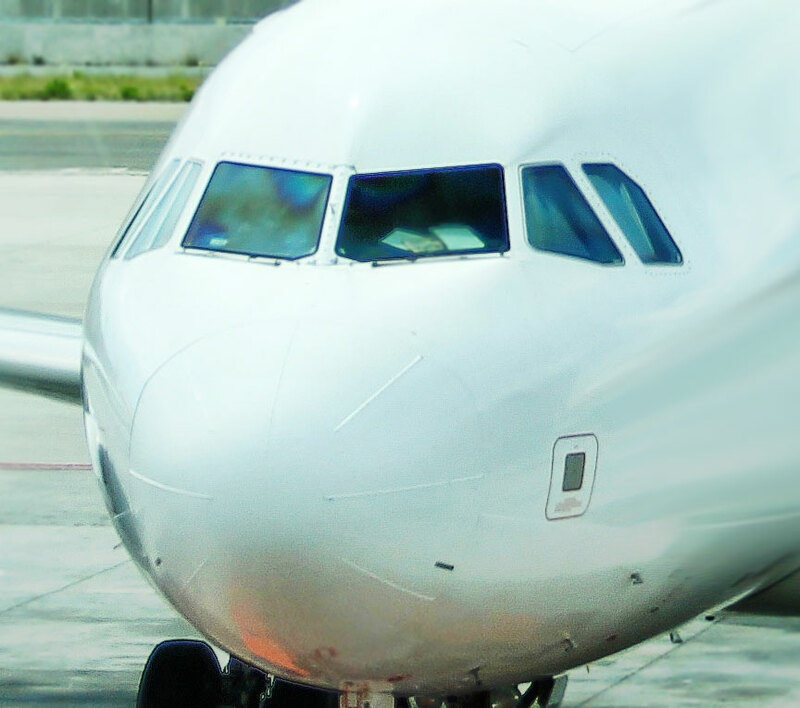 Categories: Business | Tags: airline, business, fly, job interview, las vegas, lax, phoenix, plane, sacramento, service, united airlines | Permalink. Acts of God aren’t the only events that could heartbreak [or wallet-break] a company that is looking forward to exhibiting in various trade shows. There are so many horror stories out there from companies that had great plans for a convention, until disaster hit by events out of their control. What about you? What caused you or your company to ‘exit’ past conventions. Heck, maybe you didn’t even make it to the show. Let us know! Imagine if there was a place that incorporated all the aspects of a traditional trade show but offered the experience online, 24/7/365? A place where people could still have a business to business experience, show new products, network with other industry specific peers and customers? Categories: Attendee, Exhibitor, InternetTradeShows.com | Tags: acts of god, Atlantic City, attendee, booth, convention, disaster, exhibitor, expo, las vegas, miami, money, New York, trade show, weather | Permalink. 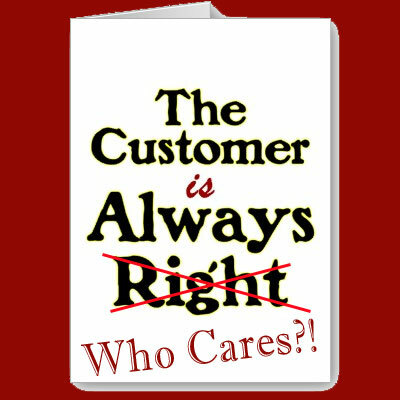 The Customer is Always…Ahh Who Cares?! In Los Angeles [and Las Vegas], we have a Chinese-American trendy restaurant called “Chin Chin“. I love the place because not only is the food delicious, but the restaurant is always clean. I’ve been going to Chin Chin for over 20 years now and even though it’s becoming less and less affordable, I am still a loyal customer for dine in and take out. The other night I phoned in a take out order, like I’ve done on many occasions, however this was the first time I was unhappy with the way I was treated. I ordered two salads and two entrees with a side of white rice, for me and my wife. Even though the kids already ate, I knew that they would want to nibble on something, so I asked for their favorite order, Chin Chin’s Lo Mein noodles off of the children’s menu. Maybe I’m high maintenance or maybe I’ve been living in California too long and have become a little bit of a pain in the tookus, but this explanation was not sitting well with me. I just ordered $60 worth of food…correction…it’s about $12 worth of food that they were charging $60 for–and they’re gonna tell me that I cannot “buy” a dish that they sell in their restaurant because it requires putting it in a box? Not to mention, the price on this tiny box of noodles is $6.00; assuredly a 300% mark up. Customer Service 101: The Customer is Always Right. That policy doesn’t mean you have to be a slave to stupid demands by unreasonable customers. That means you have to look at the big picture. Here is a friendly customer that is spending an overpriced amount of money on two meals. He is asking if he can spend more money with your company by buying an item that you already sell. If this request is beyond your pay-grade, put the customer on hold and ask your manager. What did the Chin Chin phonetress do? She blew it! “I’m sorry sir, we don’t sell the children’s Lo Mein noodles for take out anymore, you will need to buy the adult portion.” She responded in a curt, ‘I could care less’ kinda tone. I wanted to jump through the phone and scream at this woman at the top of my lungs. I didn’t, but I definitely wasn’t feeling great about the service I was getting. It wasn’t even so much that they couldn’t do it, but the way she spoke to me. All she did was quote policy that shut me down. Not once did she make an effort to make me happy. In over 20 years, I have purchased at least $18,000 worth of meals from Chin Chin. I got this figure by adding $75 (one visit per month) x 12 months x 20 years. Not included in that estimate is the multiple visit months or visits where I brought a larger party of friends and family members, closing checks out worth $200-$300. With that kind of loyalty, I expect better service. But even if I was a first time customer, an expectation of good service is not unreasonable. Instead of fighting me or being rude to me and standing her ground, she recognized that this customer [me] may need the assistance of a manager. He added the item [that they already make and sell] to the to-go order, I paid an additional six bucks and everyone was happy. I’m throwing all this down because I want you to see the importance of good customer service. And with all of that upside for this company, one uncooperative phonetress almost chased me away. Yes, whether justified or not, I was so bothered by this silly new policy and her rude, unwillingness to work with me, that I was done. The manager saved our business relationship. However, if that manager demonstrated the same lack of customer service skills, I was outta there and never coming back, even though I loved Chin Chin for so many years. You may think that’s silly. You may think that’s an overreaction. I’m here to tell you that my situation is nothing compared to most of your other customers–especially young buyers like Millennial kids. Folks walk away from businesses for a lot less. Take this seriously! Make those four assets a standard practice at your business and you are guaranteed to succeed. Go get ’em! NOTE: Chin Chin and I are speaking again; we have kissed and made up. I want to make sure my one negative experience doesn’t sway you away from the best Chinese Chicken Salad in the business. If you’re in the Los Angeles or Las Vegas area, I highly recommend you check out Chin Chin for yourself. You can find all their locations on their website at www.ChinChin.com. Categories: Business | Tags: business, california, chin chin, customer service, las vegas, lo mein, los angeles, mark up, restaurant | Permalink. SEMA Show 2013 drew more than 60,000 domestic and international buyers. The displays are segmented into 12 sections, and a New Product Showcase featuring nearly 2,000 newly introduced parts, tools and components. In addition, the SEMA Show provides attendees with educational seminars, product demonstrations, special events, networking opportunities and more. If you’re attending the show, download the SEMA Show App HERE. November 2 8:00 a.m. – 5:00 p.m.
November 3 7:30 a.m. – 5:30 p.m.
November 4 7:00 a.m. – 5:00 p.m.
November 5 7:30 a.m. – 5:00 p.m.
November 6 7:30 a.m. – 5:00 p.m.
November 7 7:30 a.m. – 3:00 p.m.
LVH exhibits open at 8:00 a.m. Tuesday through Friday. November 4 9:00 a.m. – 5:00 p.m.
November 5 9:00 a.m. – 5:00 p.m.
November 6 9:00 a.m. – 5:00 p.m.
November 7 9:00 a.m. – 4:00 p.m.
Gold Lot: located across from the Convention Center entrance on Paradise Road. Green Lot: located on the Southeast corner of Swenson and Desert Inn, behind the Convention Center. This lot is unavailable on Friday, November 4. Handicap parking is available in the Gold Lot. Categories: Attendee, Exhibitor | Tags: attendee, automotive, car, convention, exhibit, exhibitor, expo, las vegas, las vegas convention center, paradise road, sema, show, trade show | Permalink. Are slot machines at Las Vegas airport a tourist trap with bad odds? I’ve been to Las Vegas so many times, I have become an expert on all things Sin City. I’ve given so many Vegas Tips over the years to friends and associates that I figured I’d just continue the trend right here on our blog. Obviously, since this is a new blog, you didn’t get a chance to hear the first 3,420 tips I gave out to my power circle. However, instead of starting over and back tracking to help you catch up, I decided to just keep moving and start with Vegas Tip #3,421. When you arrive in Las Vegas for your expo, you will walk off the gate to the sounds of bells, whistles and sirens. 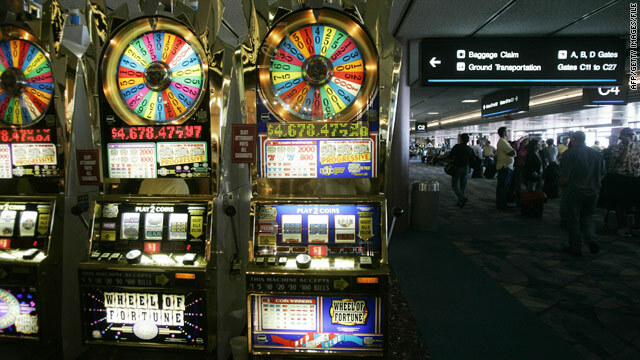 There are approximately 1,300 slot machines at McCarran International Airport. And while it’s kind of fun and exciting to make that entrance, it’s rare that you will actually sit down in front of a machine and begin gambling. Most folks like to get to their hotel quickly so they can give all their money to that venue. It’s only when you’re leaving town that these machines start calling to you as you wait to begin boarding. I’ve always been told to stay away from those slots. I’ve been warned that they are programmed with less odds than the machines on the strip. Not being much of a gambler my whole life, I believed that advice and never put anything into those puppies–until one strange two hour business lunch. About ten years ago I was asked to fly to Vegas from Los Angeles for a business lunch. My flight was to land at 11am and my next flight back to LA was leaving at about 3pm. Pretty much enough time for a two hour meal and brief conversation. The engagement was very productive and as I got back to the airport to head home, I felt pretty good about the potential relationship with this party I had connected with. I was a smoker back then so I made my way to the smoking room at the airport to have a couple butts before my flight boarded. In Las Vegas, the smoking rooms are full of slot machines. “Ah what the heck,” I thought as I opened my wallet to see how much cash I had. There were two twenties in my bill fold and I decided to stick them both in the dollar machine. Even not being much of a gamer, I know to always play MAX credits when using slots. It makes no sense to play the minimum bet because the pay out is much larger with all allowed credits in the game. This game had a $2 max credits requirement so with $40 on a dollar machine, I was gonna get 20 spins. Nothing. Nothing. Nothing. Nothing. Nothing. Nothing. Nothing. Nothing. Nothing. Nothing. Nothing. Nothing. Nothing. Nothing. Nothing. Nothing. Nothing. Nothing. Nothing. I got down to my third cigarette and my final spin and bam! One seven, two sevens, three sevens and all the bells went off. In my subconscious mind I knew I won something but didn’t think it was gonna be all that much so I had a very casual response as people started gathering around me. “You just won $5,000.00,” a little elderly woman said to me with a beaming smile. “I did?” I asked. I looked at the machine and yes, I most certainly did. Vegas fun for your iPhone. Click on logo to download. Truth be told, after paying taxes on it, it was more like $3,200 in winnings, but even still, not bad for a little lunch break out of town. Just about everything that players believe about slots is untrue. Here are the most common myths and facts. Of course, the best way to win in Vegas is…to simply not play. About 80% of people who gamble anywhere on their visit go home in the negative. Another 11% come back even. And the remaining 8-9% return ahead. You’ve worked too hard to hand over your earnings that easily. Categories: Attendee, Exhibitor | Tags: airport, convention, expo, Internationa, internettradeshows.com, its, las vegas, McCarran, nevada, shows, slot machines, trade show, vegas tip, wayne lewis | Permalink.